Yesterday was a day of chores (just the usual - post office, bank, groceries). I no sooner decided that I deserved to treat myself than I found myself at my local fabric store. Backing and binding fabric have been chosen, all Anna Maria Horner Little Folks. 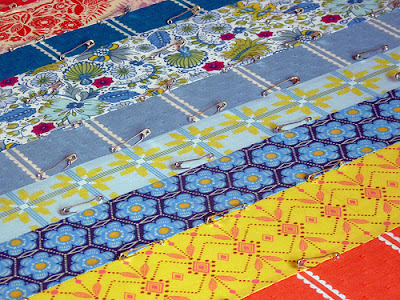 A whole quilt made from voile fabrics! Supersoft. I am all set to go now. Today I have basted the quilt, and I can't wait to start quilting. Hopefully the voile fabrics will cooperate nicely with my sewing machine. As a little side note - masking tape and voile fabrics don't mix well. I used tape upon tape to keep the backing fabric firmly tacked to the floor. Mind you not all masking tapes are created equal either, some are just more sticky than others, even if they all say "High Tack". This fabric line is so beautiful. I can't wait to see the finished quilt. Love & blessings from NC! It's so beautiful Rita - can't wait to see it all done. I'm a little nervous to try and quilt with the voile - it's so soft but seems so slippery! 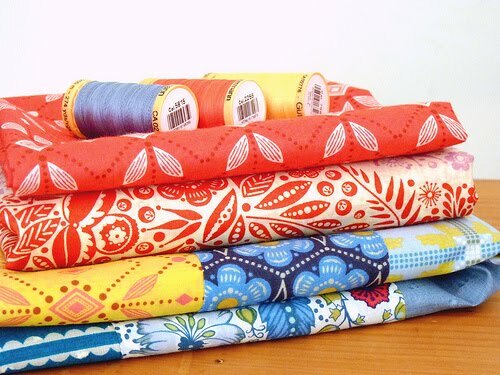 I wish my local fabric store had such goodies, though I'd probably be bankrupt several times over if it did! Quilt is looking fantastic already, can't wait to see more! I've never actually felt that fabric, but I bet it is just gorgeous. Hope its not too fine to quilt. ooooooohhhh, what gorgeous colors! I've got to find some of this fabric to look at and touch! Hi there! 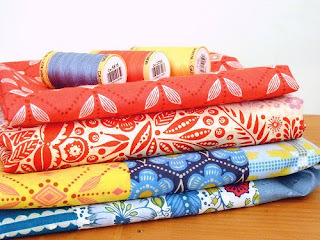 I just stumbled across your blog via the "Top 5 Sewing Blogs" article on associated content and I must say that I just love what you're doing here! I'm now a follower and can't wait to see what you do in the future! I have most of those fabrics but haven't sewed them yet. It will be interesting to read your assessment. I hope it's easy to sew/quilt because they sure are gorgeous. Very nice. Can't wait to see the finished quilt. Wow! You work fast! I love your color palette. Rita, this looks lovely! About the tape being an issue--I read from Ashley over at Film in the Fridge several months ago that her normal basting spray hadn't worked for her when she was using the voile, either. Must be something inherent in the weave that doesn't like sticky stuff!